The Delaware Information and Analysis Center (DIAC) helps safeguard the community by serving as a dynamic security nexus. 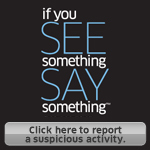 To detect, prevent, investigate and respond to criminal and terrorist activity, we disseminate intelligence and facilitate communications between state, local, federal agencies and private sector partners, to help them take action on threats and public safety issues. DIAC provides intensive multi-disciplinary training to private and public safety professionals, with exercises to strengthen counter-terrorism readiness. Help us keep society safe by submitting information about wanted individuals, unsolved crimes or potential threats. DIAC Partners Learn More Need Help? The Delaware Information and Analysis Center (DIAC) is an Intelligence Sharing Initiative owned and operated by the Federal, State and Local Public Safety Partners of the Region. © 2010 DIAC Delaware Information and Analysis Center. All rights reserved.